This year’s Father’s Day gift from Casey and the boys was two tickets to see Green Day (one of my all-time favorite punk rock bands) live in Fargo. The concert was last Friday (July 10th), and they put on a great show. I became a fan of Green Day as a teenager with the release of Dookie , the band’s major label debut, but really fell in love with the band after they released American Idiot in 2004. That album, along with their latest effort, 21st Century Breakdown , rank among my all-time favorites. Needless to say, Green Day puts on an amazing live show. They played loud and long – over two hours of music ranging from their newest record back to the pre-Dookie classics. Billy Joe did a pretty good job of energizing the crowd and keeping them engaged. A few lucky fans even got to sing vocals on Longview, while one Grand Forks teen got a chance to play lead guitar on Jesus of Suburbia. 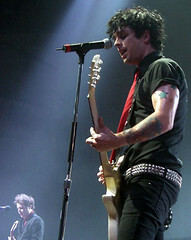 Green Day is one of those band you’d expect would simply fade away after a few years of hits. Instead, in the second decade since their mainstream debut, their music is even better than their original material. It’s a testiment to great song writing and a willingness to evolve and take risks, such as creating rock operas and a musical.